The Islamic New Year falls on the first day of Muharram, the first month in the lunar Islamic calendar. It commemorates the Prophet Muhammad’s migration from Mecca to Medina. Muslims in many countries have different ways to celebrate the coming of this new year. 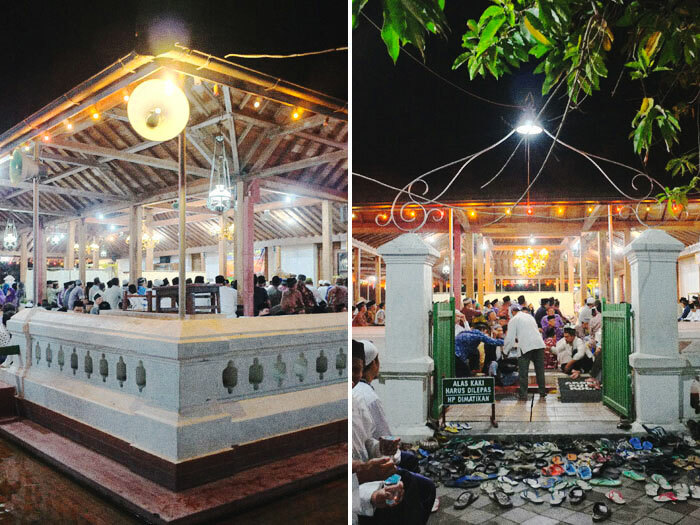 In the island of Java, where the practice of Islam is sometimes intertwined with the teaching of ancient beliefs, some people come to sacred old places in the new year’s eve. 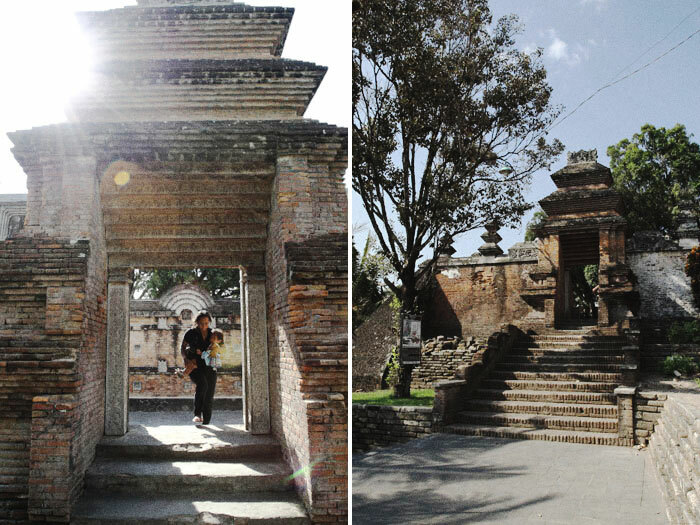 In Kotagede, a district in the province of Yogyakarta, also the ancient capital of the Kingdom of Islamic Mataram, people come to the ancient royal cemetery around the site where somewhere in seventeenth century, the sultan’s palace was standing. The building has long gone, but its spirit remains alive until today. The Kingdom of Islamic Mataram was divided by the Dutch in the eighteenth century into two. Later in the nineteenth century, each of those was restructured by the British. So today there are two kingdoms, each with one duchy. 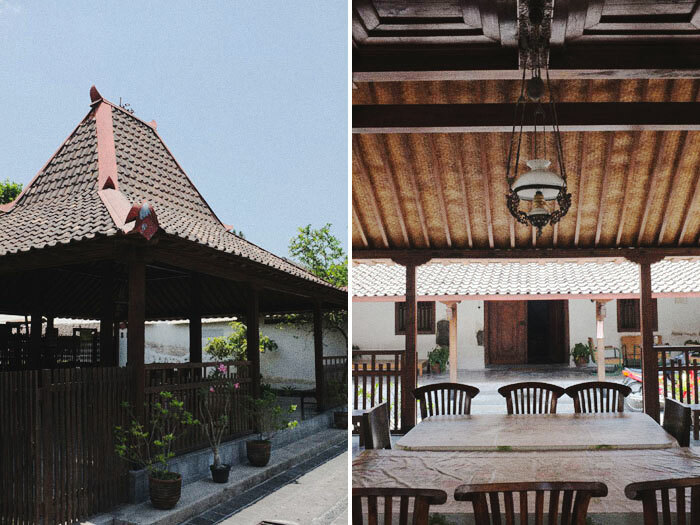 Coming to Kotagede is like tracing back the glorious day of the Islamic Kingdom of Mataram. 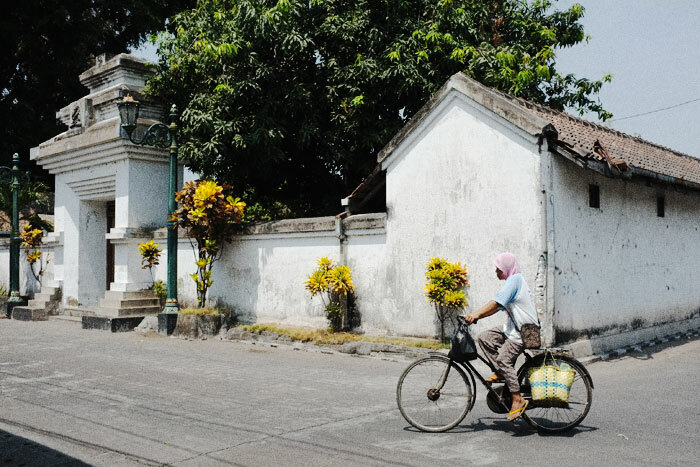 October last year, I flew to Yogyakarta and stayed in a small hotel near the ancient site of Kotagede to witness the ritual of Islamic new year. I arrived one day before the new year’s eve. It’s a walking distance from the hotel I stayed to the ancient capital. Well, at least it took fifteen minutes of walking fast through kampongs. That afternoon, I went straight to the former site of the city where there were still standing the royal grand mosque, the royal cemetery, and the royal bath. Wandering in the royal complex of Kotagede often means walking between the walls. The city seemed to be built within layers of fortresses. 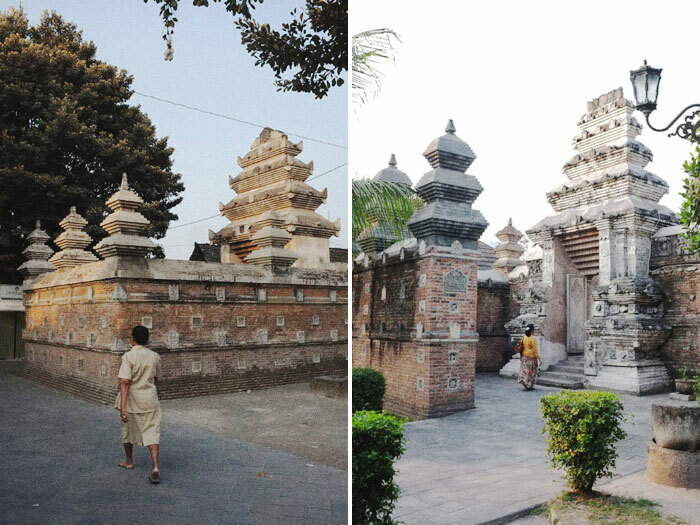 Despite the fact that Mataram was an Islamic kingdom, the architecture was still very much influenced by Hindu. Sometimes, I felt like walking through the time tunnel that got me back in time. Inside the complex, there was still no sign that the new year would come. No offerings, no burned incenses. 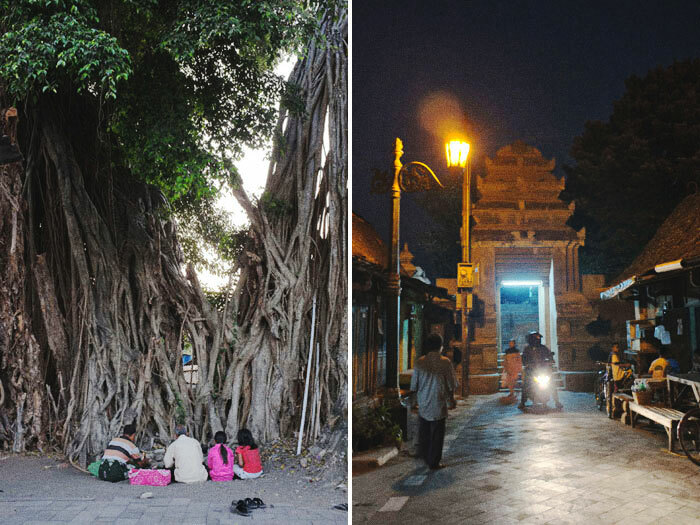 But outside, under a huge tall very old banyan tree, not far from the royal grand mosque, a family consisting of a father and two daughters came with a shaman. They took off their shoes and sandals and sit on the ground. The shaman wearing a sarong, started to burn incenses and whisper a prayer. I had no idea to whom the prayer was said, but he looked deeply immersed in his prayers. I guessed the new year’s eve came a little bit earlier for this family. Suddenly, the sound of azan which is the calls for prayer, came out from the loud speaker of the grand mosque. People left their houses in responding to the calls. They walked to the mosque in Muslims attires for dusk prayer. The former royal complex is today surrounded by kampongs. Exploring Kotagede also means exploring the kampongs. In every kampong I came to, I always found a modest community centre. 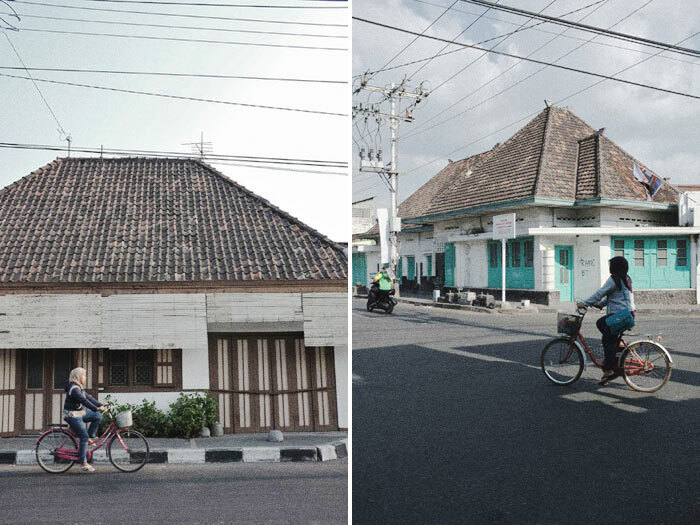 It’s more like a Pendopo, a semi open single building covered with traditional style roof of Joglo. 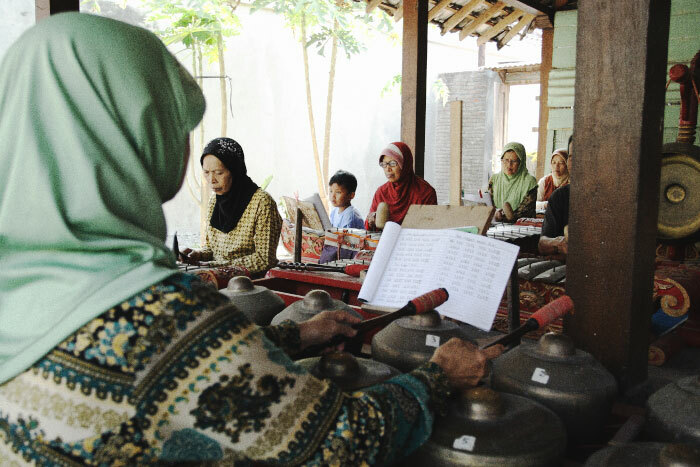 In one Pendopo, I found a group of women sitting on the floor, playing sets of gamelan, the traditional Javanese instruments. They were rehearsing for a performance held in the next few days. They were so friendly they welcomed me to watch and take pictures. 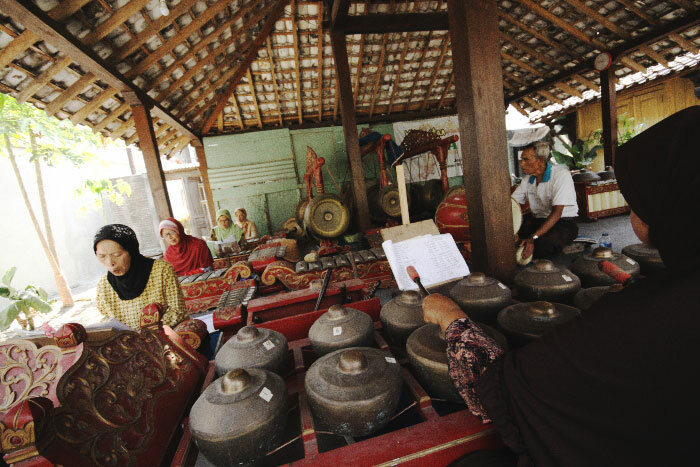 Listening to the sounds of gamelan was like magical. It evoked the spirits of the past. 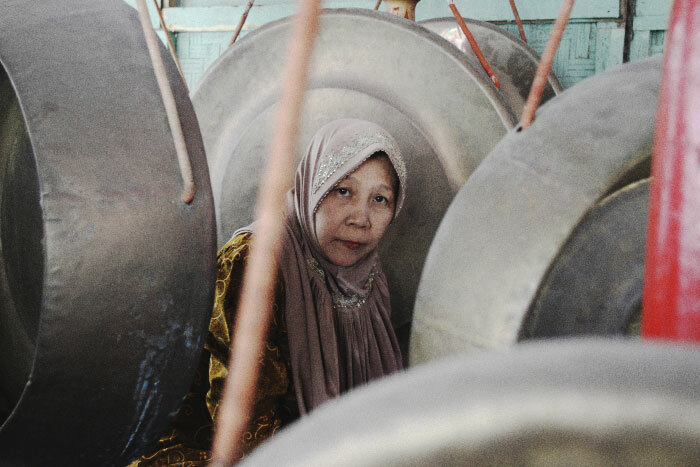 I talked with one of the women about the ritual of Islamic New Year in Kotagede. 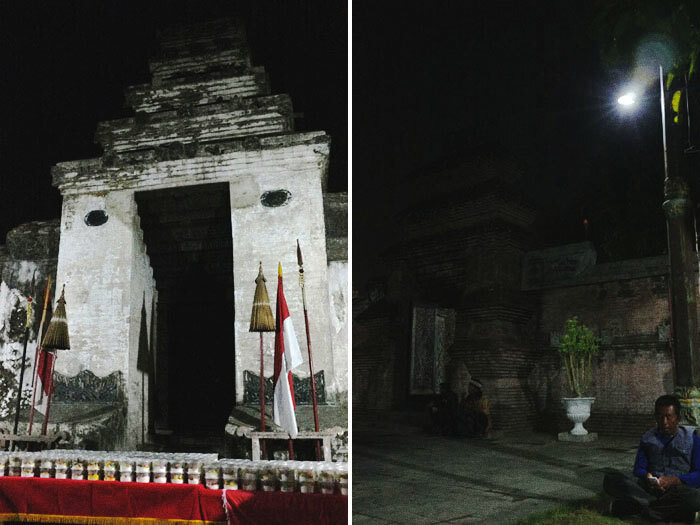 She told me to go to the old royal cemetery located right at the backyard of the royal grand mosque of Mataram in the new year’s eve as it became the centre place of the ritual. The women told me that all the people coming for the ritual were from out of town. 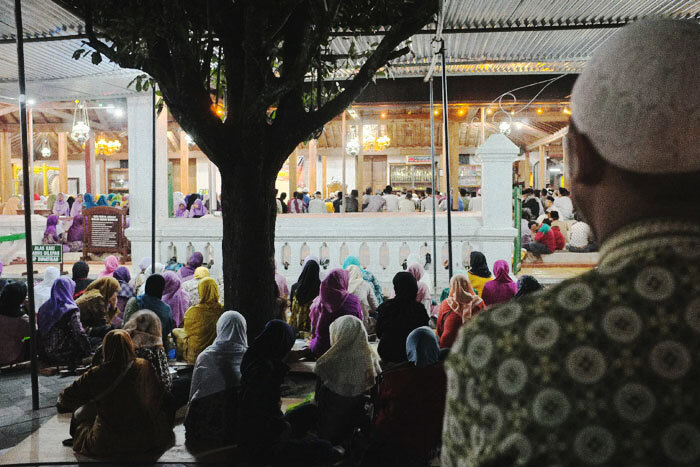 No one living in Kotagede came for the ritual as they were followers of Muhammadiyah, a movement arose in the early twentieth century, and was meant to purify the teaching of Islam, so as not to mix up with the ancient beliefs. 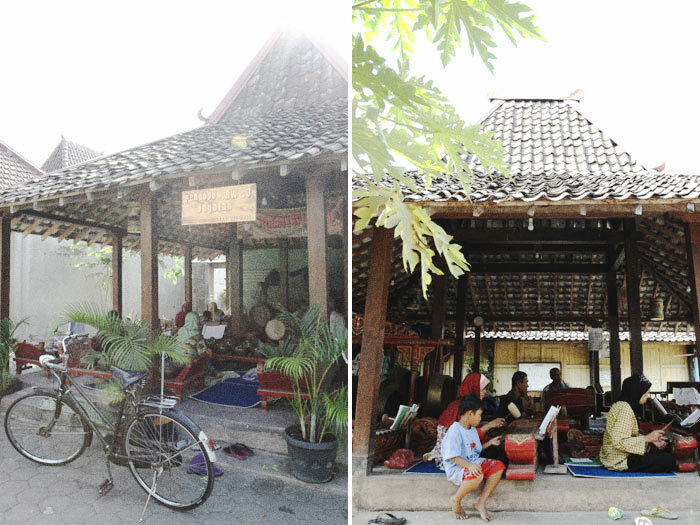 While I was walking along the narrow street of Kampong Alun alun, the sounds of azan came from the grand mosque of Mataram that noon. Muslims men wearing sarong came out from their houses and walked toward the mosque. The kampong suddenly became quiet. 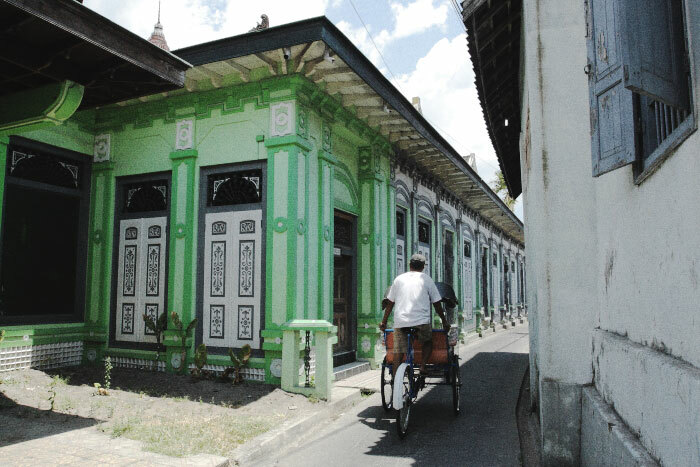 The name Alun alun refers to the old main square in front of the palace where the kampong is situated today. 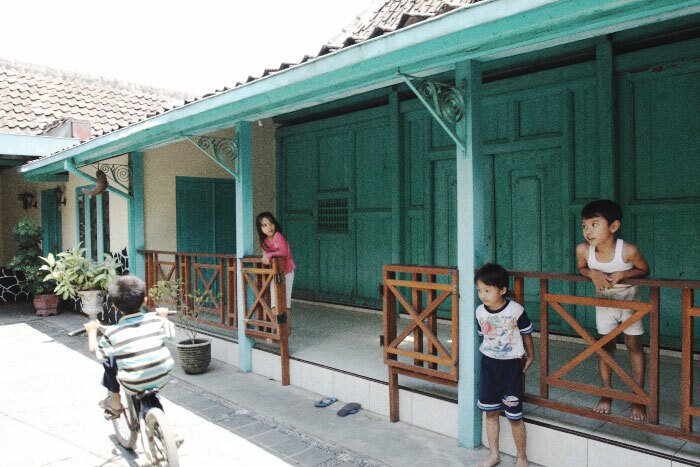 Of all the kampongs in Kotagede, this one is the most tourist friendly. 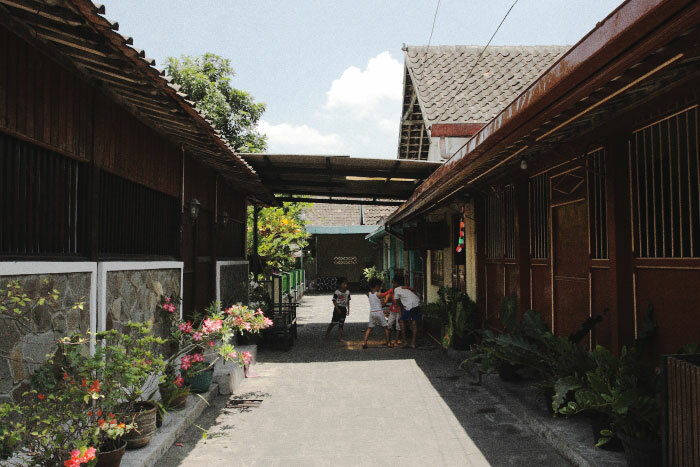 Well, it doesn’t mean we can enter all the old traditional houses along its narrow street. I tried to get a permission to enter one house that looked antique. Instead of giving me a warm welcome, the owner gave me an agitated look. The only house open is the one located right across the community hall. Many tourists will stop by at this house and look around inside it. The community hall itself functions as a library with old photographs hanged on its wall. 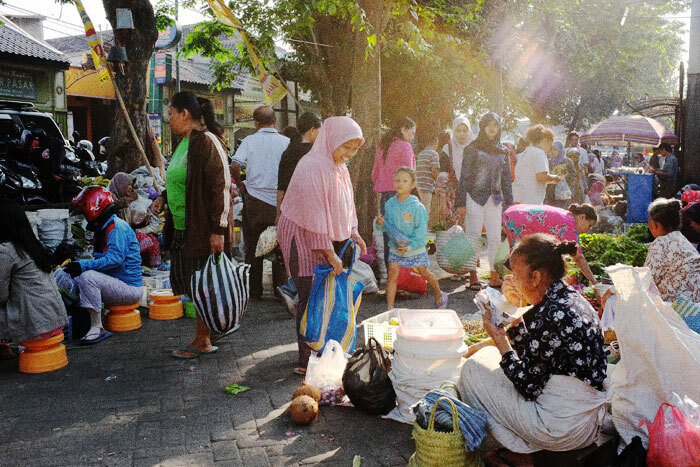 It is certain that in every old city in Indonesia, we can find traditional market that becomes the centre of people’s activity in the morning. 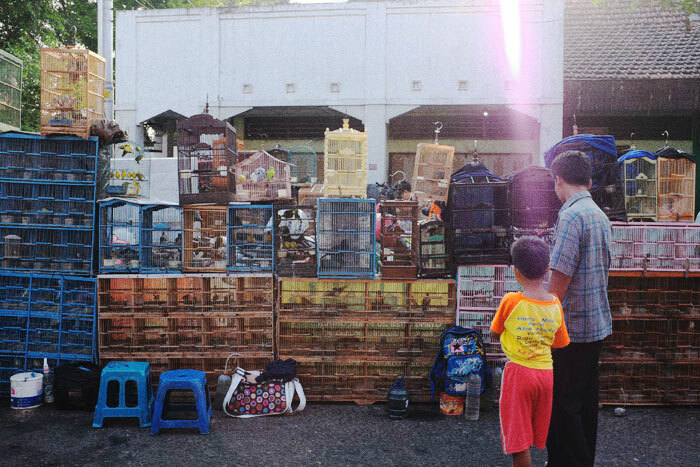 In Kotagede, they have Pasar Legi which is also the place to find many sorts of delights like traditional cakes and foods that can hardly be found in a city like Jakarta. 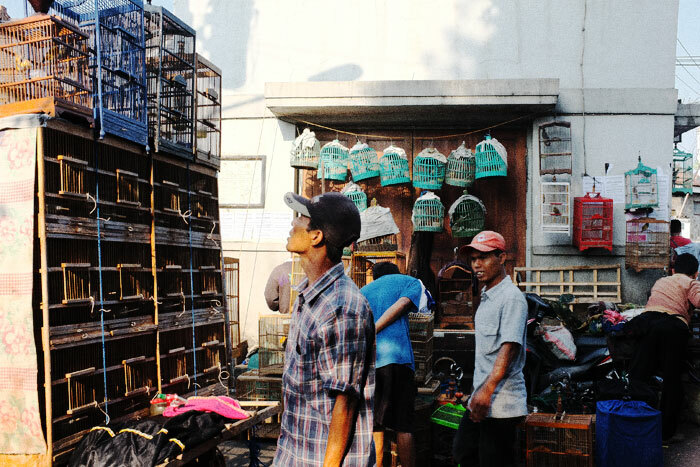 Since there are no fancy supermarket or hypermarket nearby, people still count on the traditional market for shopping groceries. It was pretty chaotic in the morning when I walked among the crowd, trying to reach an old woman who sold traditional cakes. Finally, the Islamic New Year’s eve came. The celebration took place in the former royal complex in Kotagede. There are two different groups of people coming to this place. One group go to the royal grand mosque for a reading of Al-Quran (Islam’s holy book), followed with a sermon given by an Ustadz (Islamic scholar) from Muhammadiyah. The other group come to the royal cemetery for a ritual called “tirakat.” First they burn the incense and then sit with their legs crossed. They will fast with no food and water, stay awake and keep silent for the entire ritual which in this occasion, will take overnight. These people come with different intentions and wishes. Many of them are desperate from year long illnesses, financial troubles, and perhaps romances. I was attracted with the plastic jars put in order in front of the cemetery gate. Those jars contained compotes which were specially made for such occasions. I came with my small camera (sounds being turned off) and took some pictures of the ritual. They seemed to be irritated with my presence. There was a man who kept looking at me and finally told me to leave the cemetery as he didn’t want me to take his picture. I was okay with that as it was rather spooky and I couldn’t stand the scents coming from the incenses. Contrast with the cemetery, the lights at the grand mosque located in front of the cemetery was on and the ambience was festive as if to welcome the coming of the new year. People came and gathered to read the Al Quran and then listen to the sermon. 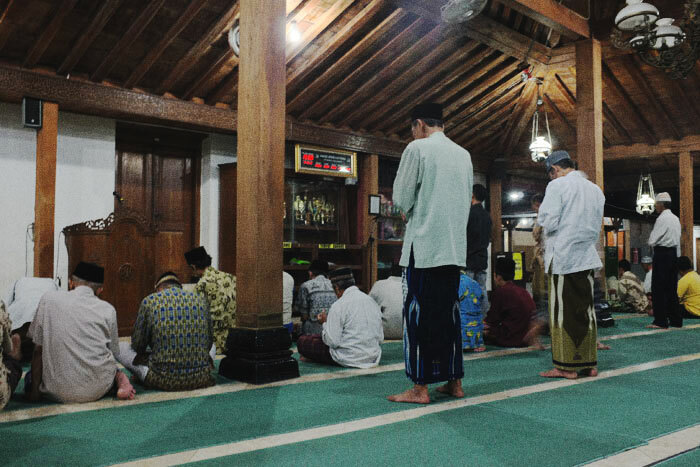 These people I saw at the mosque were against the ritual of “tirakat” as it is considered not Islamic. Soon as the sermon was over, they left the mosque and returned to their homes. 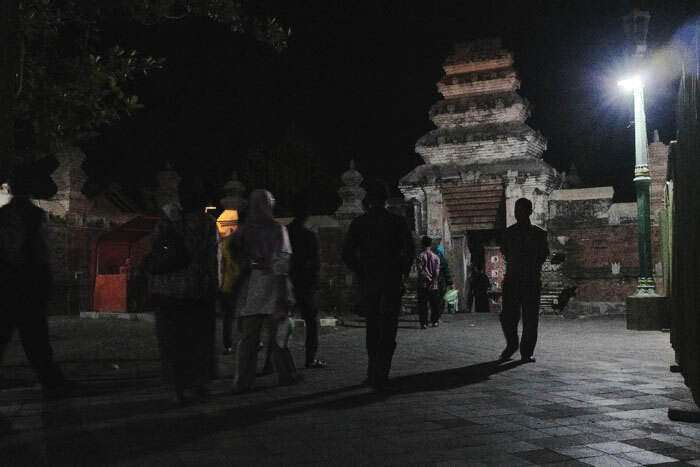 So that night, I saw two different ways to celebrate Islamic new year in Kotagede, the traditional Javanese way, and, let’s say, the more Islamic way. On the following day, I was more focused with what the Kingdom of Mataram had left in Kotagede. The palace had long gone. It was only the throne of the sultan that remained. Today, we still can see the massive stone on where the Sultan used to sit. It is housed together with another massive stones shaped like bowling balls. 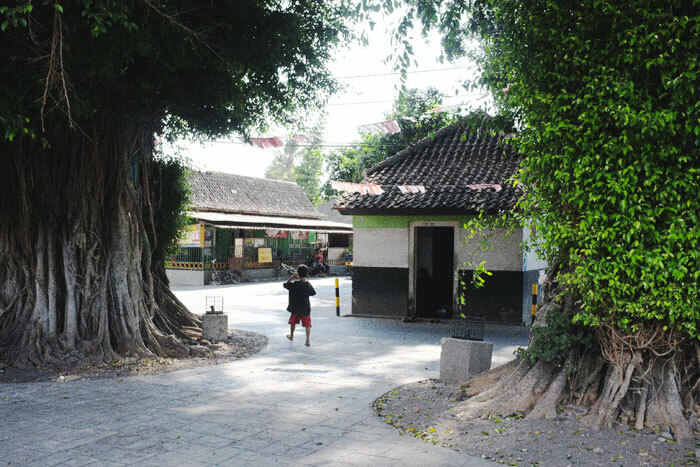 The house, located between two huge banyan trees, is locked. To get inside, we have to ask for permission from Abdi Dalam, the royal servant, stationed not far from the house. We won’t be left alone inside the house. 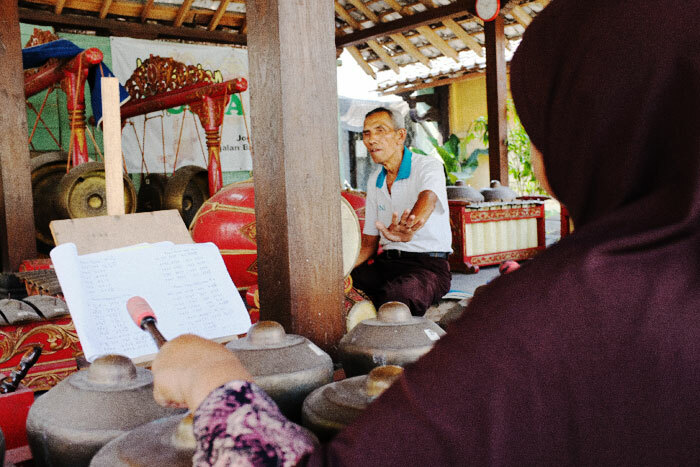 A servant will go along and tell us about the history of the stones, or watu as the locals name them. 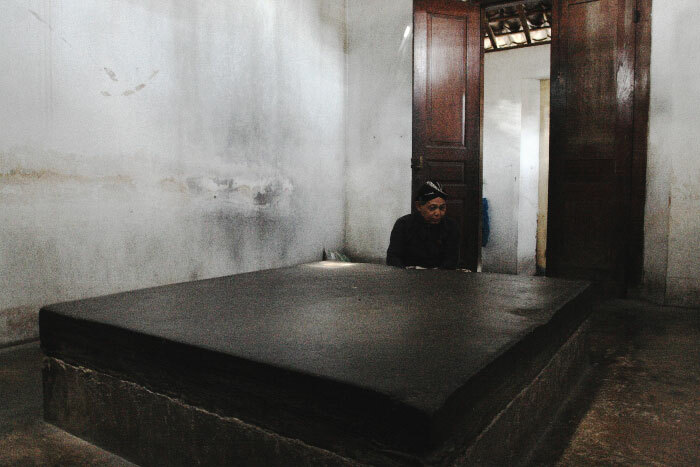 The throne, known as watu gilang, has an indentation on its edge. From that thing, we can go back far to the sixteenth century, when the Kingdom of Mataram was ruled by Panembahan Senopati, who was also the founder of the kingdom. Senopati was threatened by a man named Ki Ageng Mangir, a rebel who could overthrow him from the power. Mangir was not an easy man to conquer as he had a magic spear named Ki Baru Klinting. It would be impossible to kill Mangir with that spear around him. So Senopati came up with an idea of sending her beautiful daughter, Ni Roro Pembayun, to seduce Mangir with a dancing performance. To make it short, Mangir fell in love with Pembayun and married her. That made him the son in law of Senopati, the man he hated. The king asked her daughter to bring her husband to meet him in the palace. When someone was going to meet the king, they were not allowed to bring along any weapons. So Mangir had to give away his spear and that made him lost his magic. Soon as he kneeled to the king who was sitting on the throne, his head was by force bumped to the stone and crushed, leaving a mark of indentation that we can still see and touch until today. Sitting inside the house made me feel like completely isolated from the today’s world as there was no light and window in it. No wonder if some people come to this place to meditate in front of the stone. Since it is sacred, people put offerings like flowers on top of it. As for the bowling ball shaped stones, there are three of them which were also sacred. 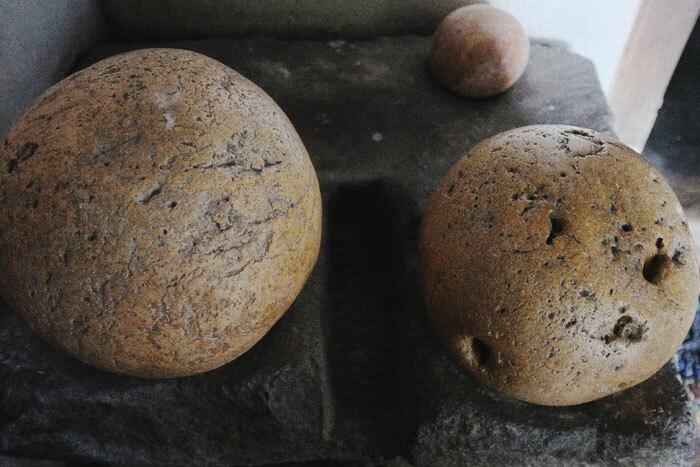 The servant said that those were balls used to be played by Raden Ronggo, the son of Panembahan Senopati, when he was a little kid. Rationally, it would be way too impossible for a little kid to play with such heavy balls like those. I would rather listen to much more sensible version of those balls which said that those were actually canon balls used to attack the Dutch in Batavia in the seventeenth century. Kotagede was actually a city inside the walls. It was fortified. Nearly all the walls had crumbled, only few remained. 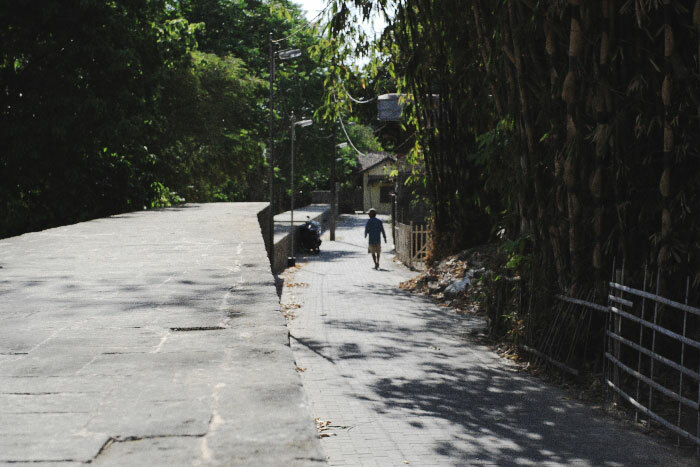 I was told by the servant to see the remnants of the wall which was not far from the house of Watu Gilang. It was a thick massive stone wall, exactly like a fort, about 1,2 meter width. My trip to Kotagede was over. It’s time for me to leave the old town with all its ancient stories behind. 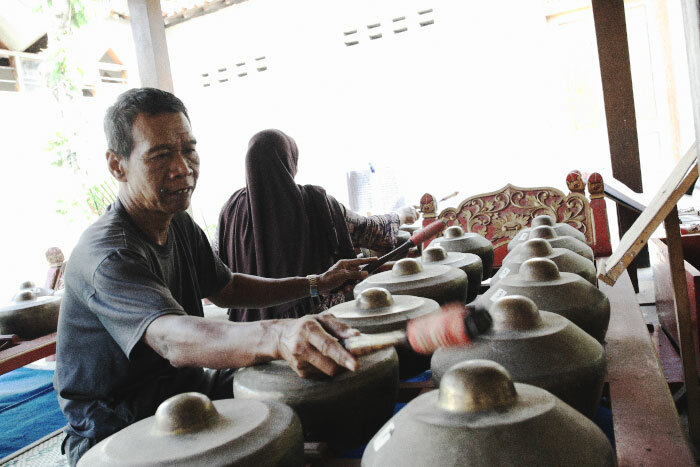 I was thinking that I was going to miss the sound of gamelan, the loyal royal servants wearing the traditional costumes, the old houses and kampongs, the narrow streets between the walls, the horrible scent of kemenyan, the market in the morning, and of course the delights I found in the market of Pasar Legi. But I shouldn’t worry because everything would likely stay the same in the next future as the time seemed to freeze in Kotagede.